A quick and easy fix for your cinnamon roll craving, these cinnamon roll pancakes are a fantastic breakfast treat! Cinnamon rolls, but easier! Have you ever had a cinnamon roll craving? I have. Plenty of times. That’s totally normal right? Cinnamon rolls are really just the best thing ever. I don’t think I know anyone that doesn’t love them. But….sometimes you want a cinnamon roll and there are none in sight. And they’re not exactly a whip it up in a half hour breakfast treat. Closer to several hours to enjoy the next day. Which is still great, cinnamon rolls tomorrow – but it doesn’t exactly help with that craving. Cinnamon roll pancakes are the answer. These taste just like a cinnamon roll, but in pancake form. And they’re way faster to make in a cinnamon roll emergency. Because those are a thing. These are some of the best flavoured pancakes I’ve ever tried. We make pancakes on a fairly regular basis around here, but typically stick to the plain old buttermilk kind. Although these banana pancakes run a close second whenever there’s some overripe bananas lying around. I think cinnamon roll pancakes are going to be joining the pancake rotation for our Sunday brunch though. They are that good. 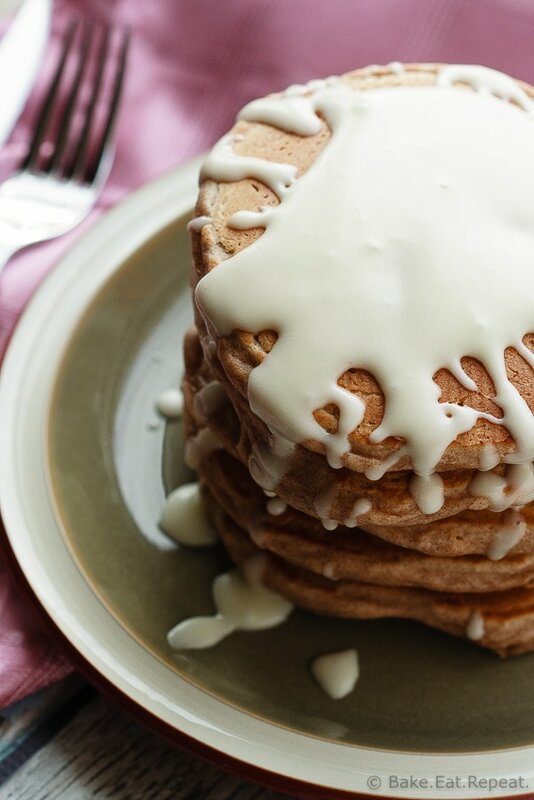 Sweet, cinnamon filled, fluffy pancakes with a cream cheese glaze. They taste surprisingly similar to the real thing. But with a lot less time and effort. They are quite sweet though, so if you want to cut down on the sweetness a bit, they are also delicious if you replace the sugar and maple syrup with a smaller amount of brown sugar. That makes for a cinnamon flavoured pancake without a sugar overload. And there’s still the cream cheese glaze to sweeten them. If, however, you want a decadent cinnamon roll pancake that tastes exactly like the real thing – make them as written. They are absolutely fantastic and definitely worth it for a special breakfast treat! 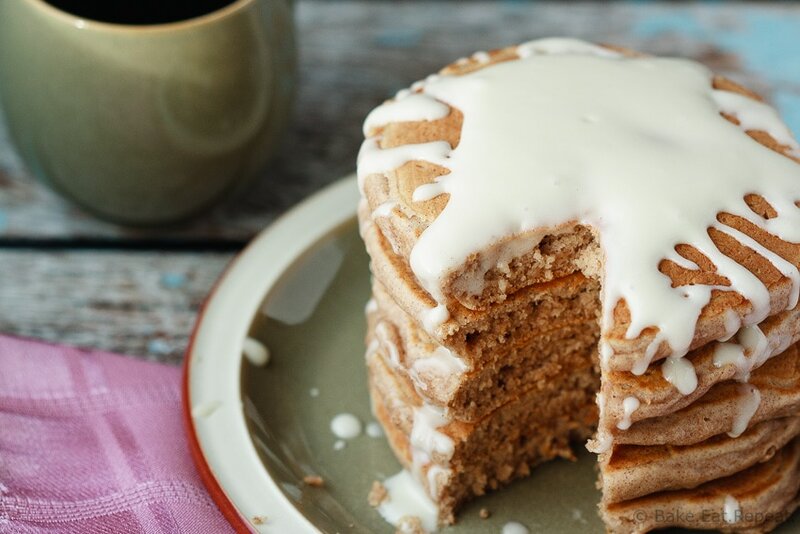 I’ve also shared this Cinnamon Roll Pancake recipe over on Food Fanatic. oh my gosh, these look amazing Stacey!! 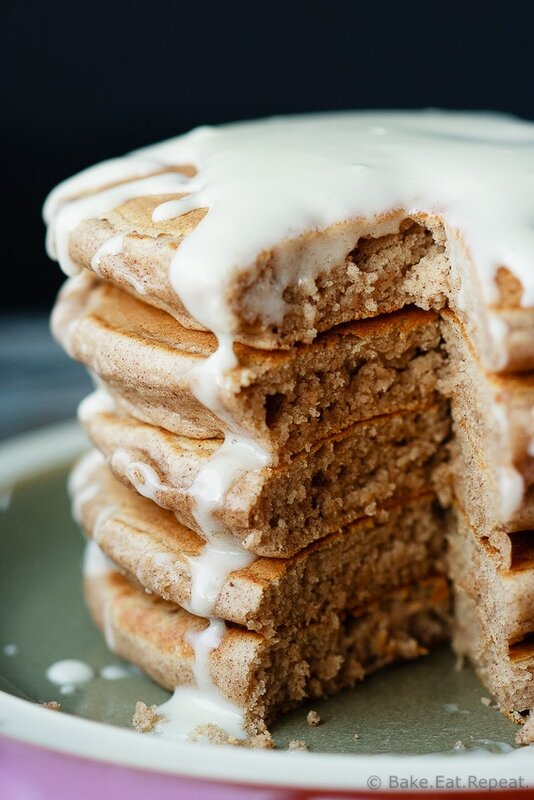 Cinnamon roll is probably my favorite thing, so I am literally drooling over these pancakes! i made these pancakes this morning and we loved them! Thanks for sharing a unique way to make pancakes. I can't wait to make them again! Cinnamon rolls are the best, and cinnamon roll PANCAKES sound like a little piece of heaven! These are a perfect indulgent weekend breakfast. I have definitely had a cinnamon roll craving many times in my life!! These look fantastic! That glaze!!! My mom made me cinnmon roll pancakes for Christmas a few years back and I still dream about them :) Time to make them for myself- like, every day! I used to always pass up cinnamon rolls when I was younger, but now that I'm older, I've finally started to love them! These pancakes looks incredible, Stacey! I love that gorgeous frosting on top. I wish I could dig right into this plate for breakfast! Oh no you DIDN'T. These are amazing. And the glaze on top is like the best possible decision you could have made. Need these for my Sunday brunch!